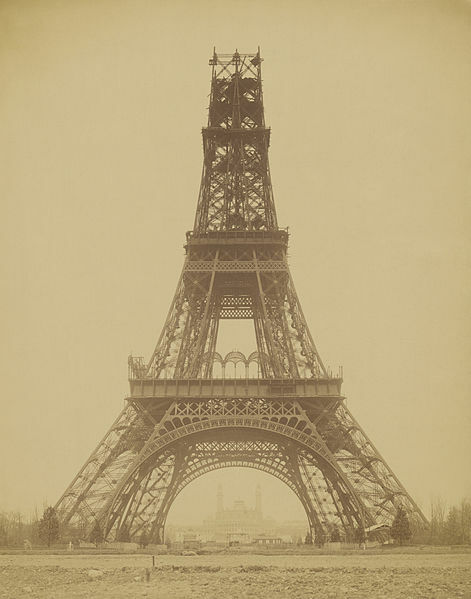 This picture of the Eiffel Tower was taken about four months before it was completed. It had been under construction for about a year and a half when this picture was taken. Hello! This week we’ll be working with the past perfect tense and the past perfect continuous tense in class. This can sometimes be a bit difficult or boring, so we won’t talk much about it on this post. I’ll assume you have already learned about it before you read this but if not, you can check out this page for an explanation and a link to some exercises. Please choose either Option 1 or Option 2. Write your answers to the questions in the comments section at the bottom of this post. Please write in complete sentences, and double-check your answer before posting it. Have you ever thought you were all prepared for something, but you realized you had forgotten to do something important? What were you preparing for? What had you done? What had you forgotten to do? Use at least three examples of past perfect or past perfect continuous in your answer. Write about something you accomplished. What did you accomplish? How long had you been preparing for it? How had you been preparing (what had you done)? Use at least three examples of past perfect or past perfect continuous in your answer. If you have any questions, please tell me in the comments section. Thanks for reading, and have a good day! Yes I have, for example my last vacation, I had prepared a entire list with all items that I needed to buy while I was in Panama. that first in my list, How could I forget it? Just remind it makes me feel really upset. Well at least I had visited Panama City and also I learned a good lesson, if you prepared a list, read it carefully and put a check in the items you already have bought it. I was prepared in oder to a technology project in the Politecnico and I had done a summary very important where I had explained very well the project, but I had leave the house very fast and I forgot the folder, after I had arrived to class and I couldn’t believe that I had forgotten the most important thing. Nice examples of past perfect! Just two quick comments/corrections: Try to make clear, shorter sentences. Your answer is combining about three different actions and thoughts, so it’s clearest if it’s divided into that many sentences. Actually yes, at the beginning of this year I faced a job interview. I thought I had been enough prepared to avoid any mistake during the conversation, however I got a little nervous, as a result I forgot to say many remarkable things about myself. then I realized I had studied all the questions and the answers before but I had not practiced face to face with someone else, perhaps that could have helped me to feeling more confident. Nice response! So does that mean that you didn’t get the job? Yes I couldn’t get it, but I´ll try again that’s the main reason I decided to go to Discovery. In fact I spoke with Angela first, because I knew she’s an excellent English Teacher then she recommended me to come to Discovery. by the way, I thought you were a square, tedious and boring teacher, fortunately I was wrong, It´s just the opposite. You’ve just got to keep on trying, so good luck. And you may have been right about me being a square, as well as a tedious and boring teacher. Just give it some time. when I was in the high school, I had prepared all my books in my backpack the day before but usually i had forgotten the backpack the next day at morning. I’m pretty sure that I understand what you’re saying here, but when we use this past perfect, it’s normally not for frequent actions in the past, but instead to order a series of actions. Can you think of another example? I started going to college, every night I had to prepare all things, one day I had forgotten activate the alarm for following day, the next day when I woke up, I had slept and it was too late, this had been my first day I was late for class. Nice example. Like I’ve mentioned to a few other people in their comments, try to divide your ideas up into multiple sentences. In Spanish, people tend to just use commas to add new ideas and continue to make really long sentences, but that’s not normally allowed in English. Other than that, your example is clear. I think something important I have accomplished has been winning the Basketball National Championship in 2011. We had been preparing for it at least three years before, since 2008, training three days per week two hours each day, also eating healthy, extra games and commitment with the team and our studies. We won the opportunity to go to El Salvador and play in the “Juegos Centroamericanos” representing Costa Rica. Nice example–congratulations! How did things go in El Salvador? Thank you! Everything turned out great. It was an amazing experience to travel to another country with the team, we all had a lot of fun. And about the competition we ended up in third place, the other teams were pretty good and we learned a lot playing against them. Nice! Good to hear. I think it would be cool to go to El Salvador. I’ve heard many different things about it, so it would be interested to find out what it’s like first-hand. In my last vacation I went to Tamarindo beach with my friends, we leave at 3:00 pm of Palmares to arrive Tamarindo at 8:00 pm in the night of the Friday. We had been driving our cars for a five hours to arrive the desired place, when we arrive Tamarindo we went to the Chocolate Hostel and rent it for two days. In the Saturday we went to the supermarket to buy some things to eat and drink in the day. We were drinking beer all the day and had started at 10 am. In the afternoon, I took my bicycle and went to the beach, then I was ridding on bike for one hour due to I was knowing the place and the all things that there were around. In the Satuday´s night we went to the discotheque to listen to music and dance, the party finished at 3:00 am, and we went to the hostel to rest. In the Sunday´s morning we took our cars and went to Mario´s restaurant located in Puntarenas to eat a delicious lunch. Nice details! As I’ve commented to a few other people, if you have a new idea with a subject and a verb, it’s best to start a new sentence. There are 3 or 4 examples in your response where this could help to make it better. -I was knowing the place–> I was looking around (or something similar). Good job. See you tomorrow! I want to talk about an activity that I have done for more than 5 years. I am a pastry chef and within the activities I attend are weddings, birthdays, baby showers and more. I once had a terrible experience working for a birthday party, the client ordered a lot of products, I had to bake a 3 level cake, lots of cookies, and I also had to bake some cupcakes. I started working on this project 4 days before the scheduled date. I bought all the materials to bake everything. Oh, I was so excited! I had to be very careful when decorating, because it was a birthday present for a very important client, plus it was a very picky person. Everything had to be spotless, and had to look beautiful. Working on this project was very amusing. I enjoyed every single step of it, because I love what I do. I once heard a phrase that says “Try to work on something you like and so you will not have to work a day in your life”. Well, that’s what I did! Back to the topic! After several days of having fun with this job, It was finally done and ready to be delivered. When the customer came to pick up his order, I handed first the finely decorated cookies and the cupcakes decorated with roses and delicate flowers made of sugar. When the time came to deliver the cake, as I walked towards my client and I began to feel that the cake was very heavy, and suddenly I lost my balance, stumbled and fell to the floor with cake. I heard the cry of my client and I of course I almost died of embarrassment, sadness and distress. I did not know what to do and my client and I began to mourn! After a while, I calmed down and got out of trouble quickly. I decorated a fake cake, so my client had something to decorate the main table. I thought I was going to lose a customer due to this incident, but he still my client and still looking for me to be part of his activities. Great story! That almost sounds like something out of a movie or sitcom! I’m glad to hear that you were able to find a solution to the problem, too. When i had 15 years, I was training for 2 months a presentation at my college dance, i had done for 2 months, I knew all the choreography step by step, I had been so excited for that day, everything was going perfect, finally, came the day we went dancing, but, at that time when I was in college I went to put on my clothes dance, but my clothes were not dancing in my bag. Thanks for your comment–your example of past perfect is good, too. The first part of your answer would be clearer if you break it up into shorter, clearer sentences. Your first sentence could actually be broken into 5 shorter sentences. Either that, or you can combine them with conjunctions like “and,” “but,” or others. The main thing you should avoid is combining two or more complete sentences with just a comma, since that’s not allowed in English. Also, your story seems to have gotten cut off–what happened at the end?